Whether your Facebook page is meant for business, fans, or personal projects, sometimes it’s time to say goodbye and hit the delete button. I’ll show you those step-by-step instructions with visuals to guide you in a moment. First let’s make sure we’re on the same page – no pun intended! 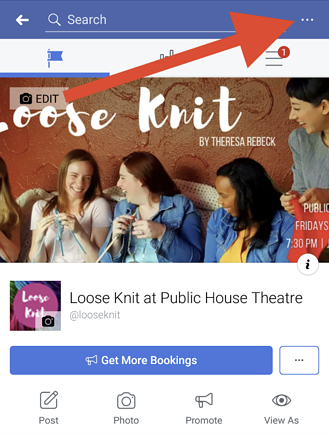 Before you delete your Facebook page, let’s take a quick look at the difference between a Facebook page and a profile, and if deletion is the best choice for you. A Facebook page is different from your Facebook profile, also known as your Facebook account. Your Facebook profile page is your personal account. 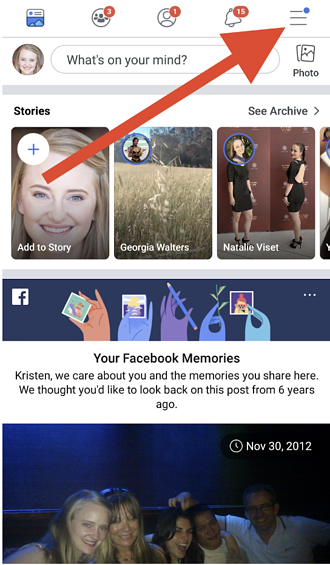 This is where you see your news feed, containing pictures of friends and family, and create posts about your life and feelings. Your profile is all about you, and connecting with friends and family. 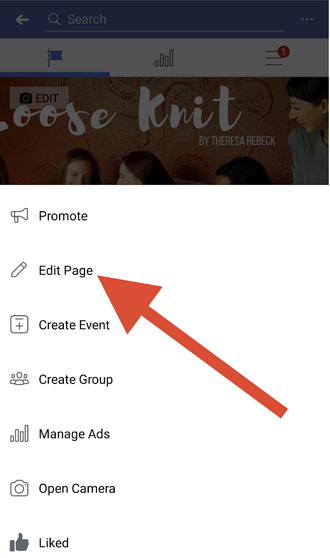 Facebook pages are created for marketing purposes: Businesses, groups, and individuals can promote themselves and interact with customers or fans. There are two types of Facebook pages you may want to delete. The first is a Facebook business page, and the second is for communities and public figures. 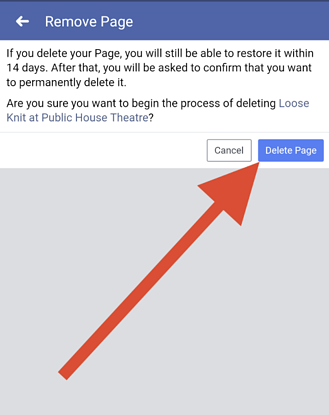 Whichever type of page you are looking at, you can use these instructions to delete your page on Facebook. Now that you’re clear on the difference between a page and a profile Before you get too far in the process, consider if deleting your page is the right thing to do. Is deleting your Facebook page the right choice? If either of these is the case for you, read the section below of merging and unpublishing pages before you go through the deletion process. Once you’re you’ve made the decision and you’re ready to delete your Facebook page, follow these steps. If you’re deleting your page on mobile, jump ahead to the next section. Begin by opening Facebook and signing into your account. Click on the page name you want to delete. Here, we are deleting the page for a play which hasn’t been running for over two years. You’ll now find yourself with a list of various Facebook settings. Scroll to the bottom of the page. In the very last row, you’ll find the option “Delete your Page.” Click the word “Edit” in that row. A notification will appear, letting you know that you have 14 days to restore the page if you change your mind. After you click that “delete” button, another pop-up will appear, asking if you are sure you want to delete the page. To make it official, go ahead click that big blue “Delete Page” button. Once you have officially deleted your page, a pop-up window will confirm the page has been deleted. 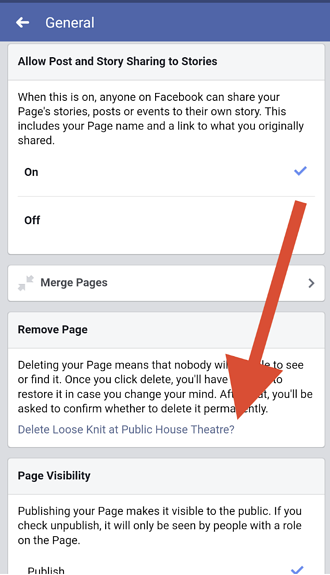 Click OK.
Want to know how to delete a Facebook page while you’re out and about? Here’s how to do just that. Open your phone’s Facebook app, and log in if needed. 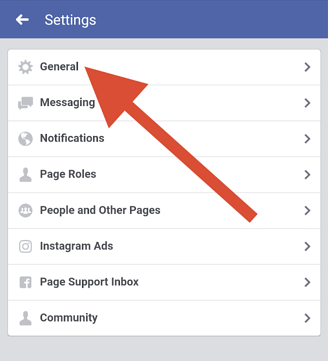 In the upper-right corner of your screen you’ll notice three line; tap these three lines for your Facebook menu. In the menu that appears, choose “Pages” with the yellow flag icon. The order of the menu options can vary; you may need to scroll down to find that icon. 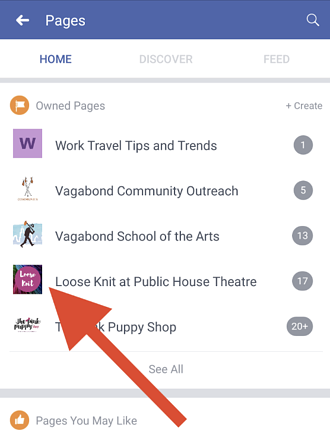 A list of your Facebook pages will appear; tap the page you want to delete. In the upper right corner, next to the search bar, click the three dots. Note: There is another option with three dots next to the page button. These three dots are to edit your button; to delete a Facebook page, make sure you tap on the dots all the way on the top of your screen. At the bottom of the section, you’ll see a question in blue, asking, “Delete <Your Page Name>?” Click on these blue words that are customized to your Facebook name. Two buttons will appear, along with the notification that you only have 14 days to restore deleted pages. Once you delete a Facebook page, even if it’s within the 14-day restoration period, it can be tricky to get it back. Save yourself potential headaches down the road and consider merging or unpublishing your Facebook page. 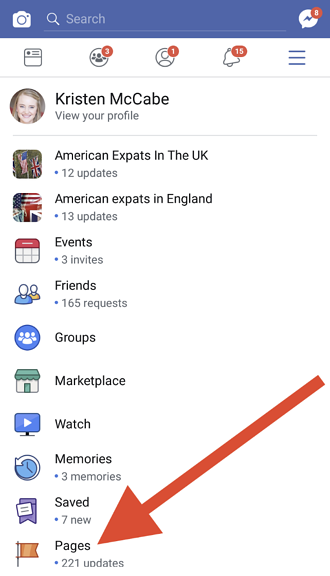 Or, if you are positive the time has come to say good-bye and delete the page, read the following section on downloading your Facebook page data. 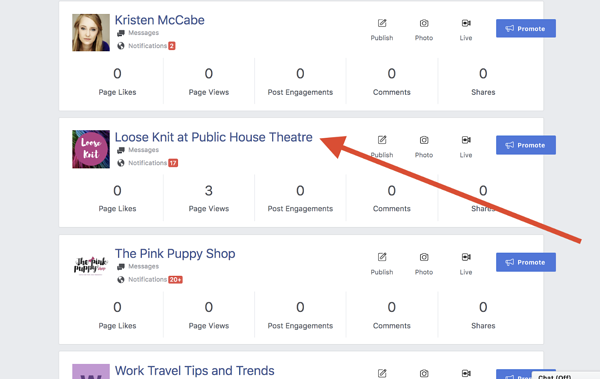 It doesn’t take much to end up with two Facebook pages for the same business, group, or event. A new person may come on board, not knowing there is an existing page. Or, when starting a new venture, two people with eager ambitions can take matters into their own hands, and both create a page. Instead, merge the two Facebook pages. To do so, follow the steps above. 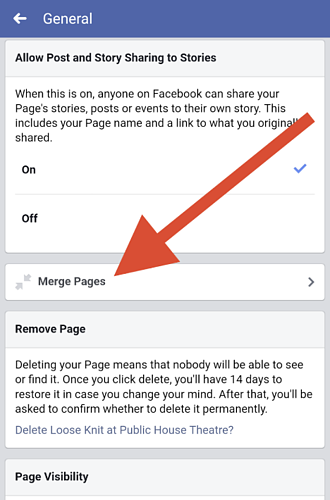 After following steps one through eight to reach the general sections, you’ll find the option to merge Facebook pages. Make sure you have administrative access to both pages, otherwise you will not be able to complete the process. You may also be required to log in to your Facebook account as an added security measure. You may want to delete your Facebook page because you don’t have time for regular posting and promotion. If this is the case, consider hiding your Facebook page instead of deleting it. Unpublishing your page is essentially hiding it. 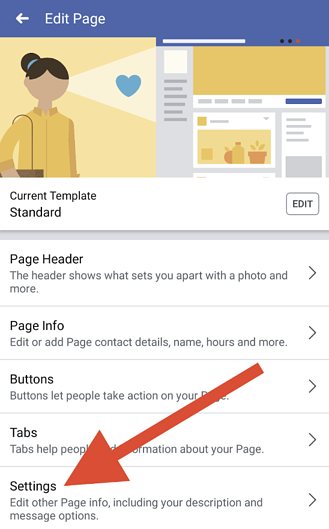 Only a page’s admins can see their unpublished Facebook page; it will not be visible to anyone else, including those who liked your page. In the same way, anyone with admin access can republish and restore the page on Facebook. This will save you plenty of time down the road if you decide you do need that page after all! To unpublish your page, follow the steps instructed and go to your page’s settings. Under “General” you’ll find an option for “Page Visibility.” Click the “Edit” button. These screenshots show you the Facebook settings on a desktop. After clicking “Edit,” simply tick the box for “Page unpublished” and save changes. You will not lose any followers if you unpublish your Facebook page, but they will not be able to find it. When you republish the page, it will once again become visible to page followers. Anyone who liked the page will be able to search for it, and it will appear in their feed. Even if you delete your Facebook page, you can still save your data. And really, why wouldn’t you want to do so? Marketing decisions are all based on understanding your audience; you never know when those insights might help you down the road. Still have questions about deleting your Facebook page? On the fence between deleting or unpublishing your Facebook page? Let these answers guide your decision. Why can’t I delete the Facebook page? Only those with admin access can delete a Facebook page. If you don’t see the options pictured above when trying to delete your page, chances are, you don’t have administrative access. Who is the Facebook page admin? How do I become one? If you created the Facebook page, you are automatically the page admin. You can also invite others to have this status. How can I delete a Facebook page if I’m not the page admin? Facebook pages are connected to individual profiles. As a result, you may have a situation where you can’t reach the page administrator. For example, the page creator may no longer be working at your company. In situations like this, you’ll need to report the page to Facebook. Once you take these steps, it’s a waiting game while Facebook decides whether or not to comply with your request. What if I change my mind after I delete my Facebook page? Facebook is strict when it comes to page deletion. The notification that appears while deleting your Facebook page really is true: You only have 14 days to bring back a deleted Facebook page. After that, it is lost to the abyss. This is why you should think long and hard before deleting. When in doubt, play it safe and unpublish your Facebook fan or business page. 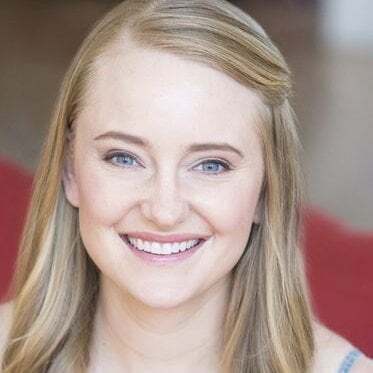 If you’re deleting an old Facebook page, chances are you may have a few other social media assets to clean up as well.